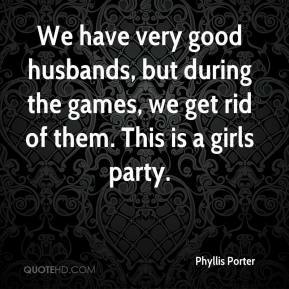 We have very good husbands, but during the games, we get rid of them. This is a girls party. If it was an elective, you'd get twenty girls and three boys doing ballroom dancing. Girls want to dance, boys don't. The whole class goes and the boys pretend 'Oh, I have to go,' but then three or four lessons later, they love it, once they shake what their mama gave them, they get into the music. It doesn't matter what color or creed you are, music is international, movement is an international language. Everybody loves to shake it. The only difference between them and my girls is that my girls gave a man his money's worth. The girls, I think they did really well this weekend. 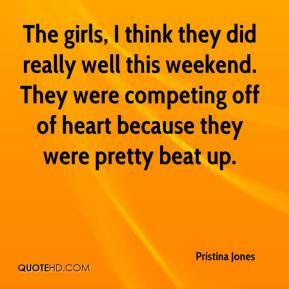 They were competing off of heart because they were pretty beat up. I wanted Sarah to speak to the team so that the girls could understand that there is a face behind the cause [of the Birdies For Wishes] program. Raising money for this wonderful cause really means more when you can connect it with a human being. Irvin has a broad taste. 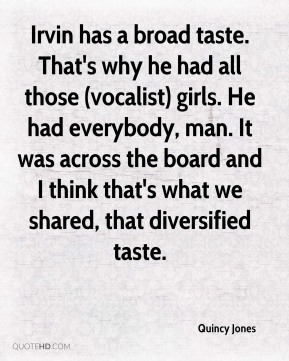 That's why he had all those (vocalist) girls. He had everybody, man. It was across the board and I think that's what we shared, that diversified taste. Ben Affleck, he looked like a little girl! 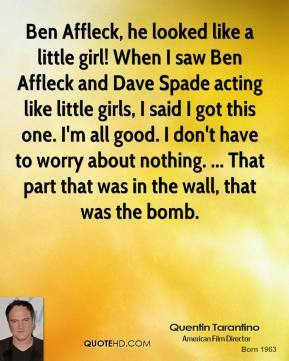 When I saw Ben Affleck and Dave Spade acting like little girls, I said I got this one. I'm all good. I don't have to worry about nothing. ... That part that was in the wall, that was the bomb. It's a big win. I told the girls that we had to take care of tonight if we wanted any shot at first place. We made some bad decisions there at the end. But my girls had the heart to come out on top. 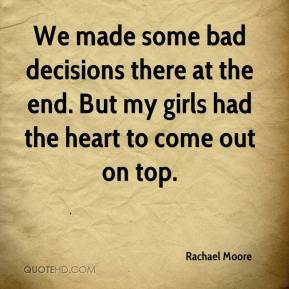 We had some errors, and it dropped the girls' morale, then they lost confidence in themselves. It's our one bad game for the week. 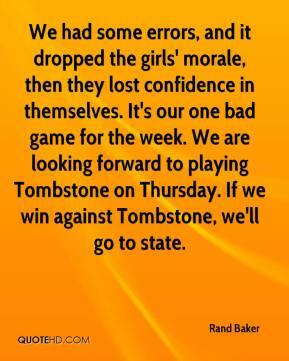 We are looking forward to playing Tombstone on Thursday. If we win against Tombstone, we'll go to state. 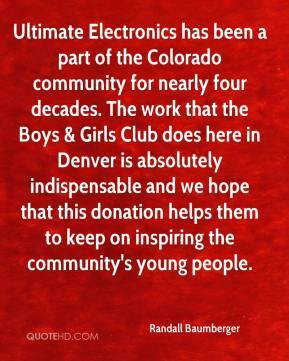 Ultimate Electronics has been a part of the Colorado community for nearly four decades. The work that the Boys & Girls Club does here in Denver is absolutely indispensable and we hope that this donation helps them to keep on inspiring the community's young people. Team work, our girls are all about team work. It's amazing. Jill is always giving positive feedback and is constantly willing to help the other girls by putting in extra time. Kristi always shows up with a smile and always calls me to ask if there is anything she can do to help the team. I truly feel blessed. The girls have done an amazing job. Any hopes I've had, they reached, and for states, I just want them to do their best individually and really hit their routine. It is so awesome that the girls had the opportunity to go and compete in a tournament of this level. I am so happy with how they performed. It was good for them to be able to see all the teams and the different types of styles out there. 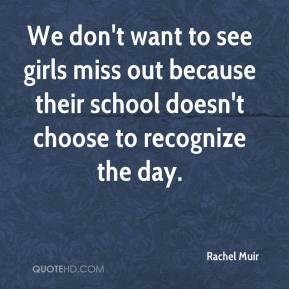 We don't want to see girls miss out because their school doesn't choose to recognize the day. This creates a culture in which girls do not have social permission to express themselves. Many girls intentionally perpetrate acts of aggression that go unseen by parents and teachers. Because they are so skilled at being subtle, girls can communicate a thousand words without saying anything. 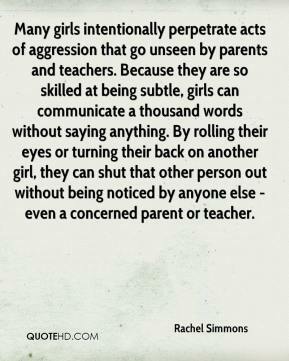 By rolling their eyes or turning their back on another girl, they can shut that other person out without being noticed by anyone else - even a concerned parent or teacher. We were pleased with our girls even though we didn't win. Against Dewey, we were smacking the ball hard. 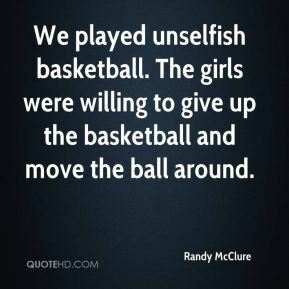 We played unselfish basketball. The girls were willing to give up the basketball and move the ball around. The girls have nothing to be ashamed of and that's what I told them afterwards. This could have gone either way. That goal gave the girls confidence. Now we find they're teaming up with Girls Inc., which supports the very things we oppose. It's very troubling. It was a close game. I was real pleased with how the girls played. In the second half, they were a little more aggressive. They just need to get a little more experience under their belts and they'll be fine. I think the accessories look very modern and very exciting. These big earrings, these big hoops. I think the girls are sort of falling in love with ... collars, neck collars.